Another Mind Magazine: Harassment In The Workplace, How Do You Deal?/Acoso En El Trabajo, ¿Cómo Hacerle Frente? Harassment In The Workplace, How Do You Deal?/Acoso En El Trabajo, ¿Cómo Hacerle Frente? Harassment In The Workplace, How Do You Deal? This is something that many people around the world have to deal with and continue to deal with as sexual harassment in the workplace is increasing each day. Many times people who are most affected are women who come to other countries like USA, Italy among others, with false ideas of offers of an excellent working life leaving everything behind to give her family a better future, but often they are victims of deceit and mistreatment as many of them are here in the countries illegally and feel the need to resort to prostitution and think they are forced to do other jobs for which they never sought to do but think they should do them because they have no other choice, but that is only in their minds as they have rights and can contact the police and other institutions that can help them. But harassment or sexual exploitation not only occurs in women, there are also cases in men, where men have to sleep with their bosses to keep their jobs believing that it is the only option they have, but it’s not. We must remember that for both men and women there are aids that help to remove them from such abuse and sexual exploitation by traffickers of people who don’t care about human lives and just want easy money. 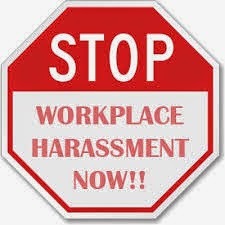 If you have been harassed at work please report it, because if someone is harassing you, they may harass another person and nobody knows what that may lead to. Have you ever been a victim or harassment, sexual or verbal or physical at work? How did you get out of that situation? Tell us your story. Acoso En El Trabajo, ¿Cómo Hacerle Frente? Esto es algo que a muchas personas en todo el mundo le ha pasado y seguirá pasando ya que el acoso sexual en trabajo cada día va en aumento. En muchas ocasiones las personas que más son afectadas son mujeres que llegan a otros países como USA, Italia entre otros, con falsas ilusiones ofreciéndole puestos de trabajo excelentes dejando todo una vida atrás para poder brindarle a su familia un mejor futuro pero en muchas ocasiones son víctimas de engaños y maltratos que por ser ilegales le obligan a prostitución y demás trabajos para los cuales nunca le buscaron pero deben de hacerlo por que no tienen otra salida, pero eso solo está en sus mentes ya que pueden comunicarse con la policía y demás instituciones que les pueden ayudar. Pero no tan solo el acoso o explotación sexual se da en la mujer, también hay casos en el hombre, donde los hombres tienen que acostarse con sus jefes para no perder sus puestos de trabajo creyendo que es la única salida que tienen y no es, debemos de recordar que tanto para el hombre como para la mujer existen ayudas para sacarlos de esos abusos y explotaciones sexuales de parte de traficantes de personas que no les importa nada y solo quieren dinero fácil. Si has sido víctima de acoso en tu trabajo repórtalo no te lo calles porque si te acosan a ti pueden acosar a otra persona y nadie sabe a dónde puede terminar dicho acoso. ¿Alguna vez has sido víctima de acoso sexual o verbal o físico en el trabajo? ¿Cómo saliste de esa situación? Cuéntanos tu historia.